Today is the birthday (1918) of Richard Phillips Feynman, a U.S. theoretical physicist known for his work in the path integral formulation of quantum mechanics, the theory of quantum electrodynamics, and the physics of the superfluidity of supercooled liquid helium, as well as in particle physics for which he proposed the parton model. For his contributions to the development of quantum electrodynamics, Feynman, jointly with Julian Schwinger and Sin-Itiro Tomonaga, received the Nobel Prize in Physics in 1965. 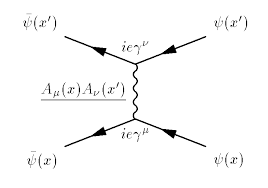 He developed a widely used pictorial representation scheme for the mathematical expressions governing the behavior of subatomic particles, which later became known as Feynman diagrams. 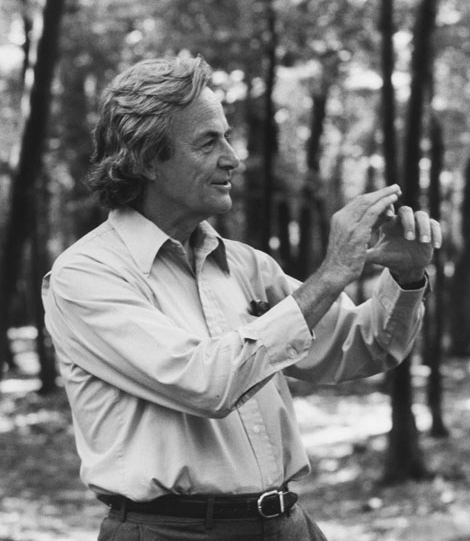 During his lifetime, Feynman became one of the best-known scientists in the world. In a 1999 poll of 130 leading physicists worldwide by the British journal Physics World he was ranked as one of the ten greatest physicists of all time. He assisted in the development of the atomic bomb during World War II and became known to a wide public in the 1980s as a member of the Rogers Commission, the panel that investigated the Space Shuttle Challenger disaster. In addition to his work in theoretical physics, Feynman has been credited with pioneering the field of quantum computing, and introducing the concept of nanotechnology. I don’t know how much of a household name Feynman is nowadays, but I know about him for several, mostly quirky, reasons. For one thing, I admire him for the importance he attached to teaching. Feynman was born in Queens and attended Far Rockaway High School. Upon starting high school, Feynman was quickly promoted into a higher math class. An unspecified school-administered IQ test estimated his IQ at 123—high, but “merely respectable” according to biographer James Gleick. Don’t get me started on IQ tests. When he turned 15, he taught himself trigonometry, advanced algebra, infinite series, analytic geometry, and both differential and integral calculus. In high school he was developing the mathematical intuition behind his Taylor series of mathematical operators. Before entering college, he was experimenting with and deriving mathematical topics such as the half-derivative using his own notation. In his last year in high school Feynman won the New York University Math Championship. The large difference between his score and those of his closest competitors shocked the judges. He applied to Columbia University but was not accepted because of their quota for the number of Jews admitted. Instead, he attended the Massachusetts Institute of Technology, where he received a bachelor’s degree in 1939 and in the same year was named a Putnam Fellow. He attained a perfect score on the graduate school entrance exams to Princeton University in mathematics and physics—an unprecedented feat—but did rather poorly on the history and English portions. Attendees at Feynman’s first seminar included Albert Einstein, Wolfgang Pauli, and John von Neumann. He received a Ph.D. from Princeton in 1942, his thesis, “The Principle of Least Action in Quantum Mechanics,” laid the groundwork for his future work in quantum mechanics for which he eventually shared the Nobel Prize. The thing that’s always fascinated me about theoretical physics is that while the mathematics is well beyond most mortals, the ideas are not all that complicated. Feynman was one of a rare breed who understood the mathematics at a very deep level, yet he was able to explain his ideas to any educated person. Furthermore, Feynman found teaching to be an important source of inspiration. If you watch The Big Bang Theory, you’ll get the impressions that “really smart guys” (i.e. theoretical physicists) are too lofty to teach. Some of them believe that, and others believe that teaching takes time from “important” research. Feynman believed that it was important to teach as part of the creative process. Let me pause for a minute and dissect this idea. Einstein once said, “If you can’t explain it simply, you don’t understand it well enough.” There’s the nub. To teach something well – anything – you need to understand it well. Just because you are a native speaker of English does not mean that you can teach English. Trust me on that. It takes years of wrestling with the mechanics of the language to be able to explain how it works – SIMPLY – to people who are trying to learn it. Any idiot can teach English from a textbook that someone else wrote; it’s another matter entirely to teach from what you yourself have explored and discovered. 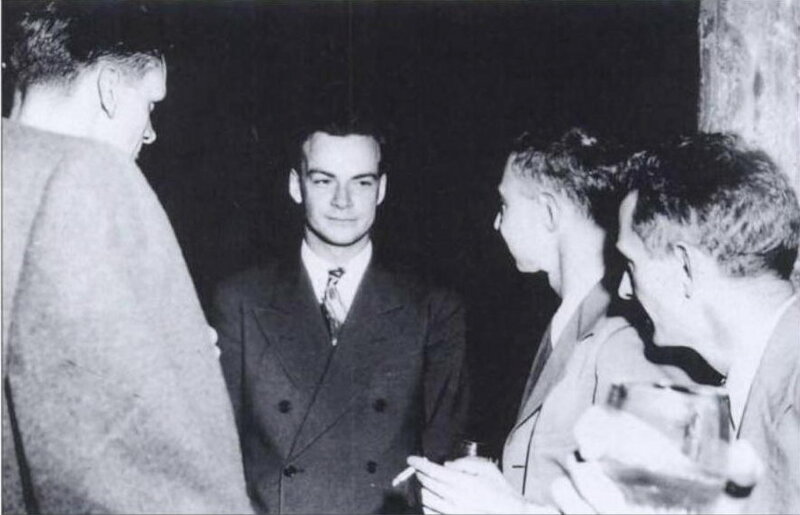 After the war, Feynman declined an offer from the Institute for Advanced Study in Princeton, New Jersey, despite the presence there of such distinguished faculty members as Albert Einstein, Kurt Gödel and John von Neumann. 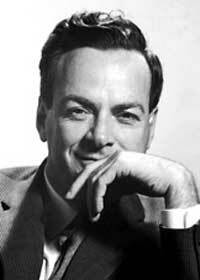 Feynman instead went to Cornell University, where he taught theoretical physics from 1945 to 1950. During a temporary depression following the destruction of Hiroshima by the bomb produced by the Manhattan Project, he focused on complex physics problems, not for utility, but for self-satisfaction. One of these was analyzing the physics of a twirling dish as it is moving through the air. His work during this period, which used equations of rotation to express various spinning speeds, proved important to his Nobel Prize–winning work, yet because he felt burned out and had turned his attention to less immediately practical problems, he was surprised by the offers of professorships from other renowned universities. Despite yet another offer from the Institute for Advanced Study, Feynman rejected the Institute on the grounds that there were no teaching duties: Feynman felt that students were a source of inspiration and teaching was a diversion during uncreative spells. Because of this, the Institute for Advanced Study and Princeton University jointly offered him a package whereby he could teach at the university and also be at the institute. Feynman instead accepted an offer from the California Institute of Technology (Caltech)—and as he says in his book Surely You’re Joking Mr. Feynman!—because a desire to live in a mild climate had firmly fixed itself in his mind while he was installing tire chains on his car in the middle of a snowstorm in Ithaca. His biographers record that late in life Feynman became obsessed with traveling to Tuva (nestled north of Mongolia), although he was unable to do so before he died. At that time, when Tuva was part of the Soviet Union, visas were hard to obtain, and travel arrangements were also very difficult (overland yak from Mongolia or a once-a-week flight on an 18-seater plane from Moscow). 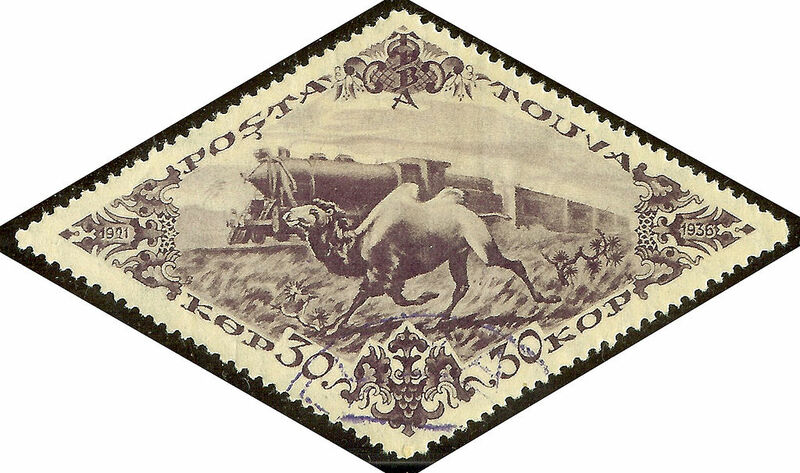 Apparently he had been interested in Tuva since boyhood when he collected stamps, and the oddly-shaped stamps from Tuva fascinated him. He looked up where it was (the middle of nowhere) and learned all he could about the place. It is an amazing destination. I’ve wanted to go there for more than 30 years. That was a big incentive I had when I applied for a job in Inner Mongolia (and wound up with visa problems of my own). Tuva is famous – in some circles – for throat singing: a way of producing several notes at the same time from a single voice, originally a shamanic practice. This video is a starter for you. You can look up plenty of astounding examples. I used to play this stuff in ethnomusicology classes and the students could not believe it was a human voice – and a SINGLE one at that. I’ll get there eventually. In honor of Feynman I suggest trying out some Tuvan food. Tuvans used to be, and some are still, primarily nomadic herders although Russification has caused major changes. As such, their diet was rich in meat and dairy products similar to the grasslands of Mongolia. 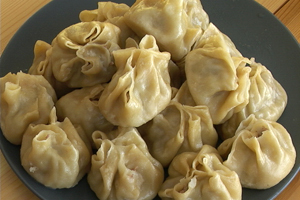 Buuz are a well known staple found in both Tuva and Mongolia. 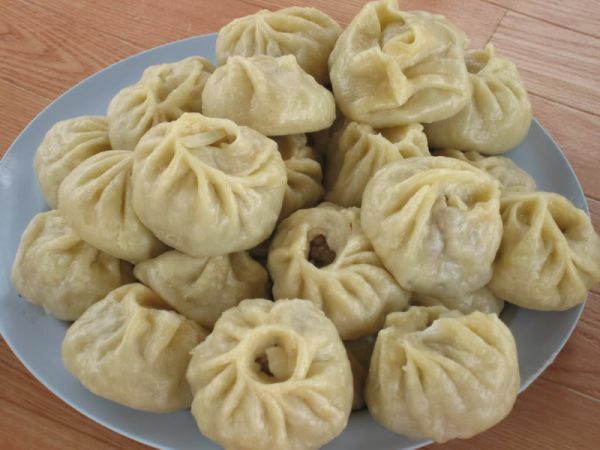 They are meat-filled steamed dumplings that are ubiquitous throughout the Asian segments of the current Russian Federation. You can find a ton of videos on how to make them if you need them. Otherwise the basics are as follows. Make a flour dough, much as you would to make pasta. Mix flour and water together to form an elastic, not moist, dough using your hands to mix them. Knead the dough for about 20 minutes until it is pliant and completely workable. Break the kneaded dough into walnut-sized balls and roll them flat into circles. Use a spoonful of your favored filling. The commonest, and most traditional, filling is chopped meat. This can be mutton, goat, yak, or whatever, but it should be fatty. You don’t need to add anything else to the filling, but modern cooks sometimes add onions and spices. Hot chile pepper is also popular. Shaping the dumplings is an art that takes long practice. The photo gives you the idea. Videos will give you others. The dumplings need to be able to sit flat in a steamer, so place the filling in the center of the dough circle and draw the dough up around it, leaving a hole exposing the meat at the top. Steam the buuz for about 20 minutes, or longer, and serve them hot with a dipping sauce of your choice. Street vendors keep the buuz in the steamer for long periods, and they are fine. Mayonnaise is a common sauce. Tea is the normal accompaniment.